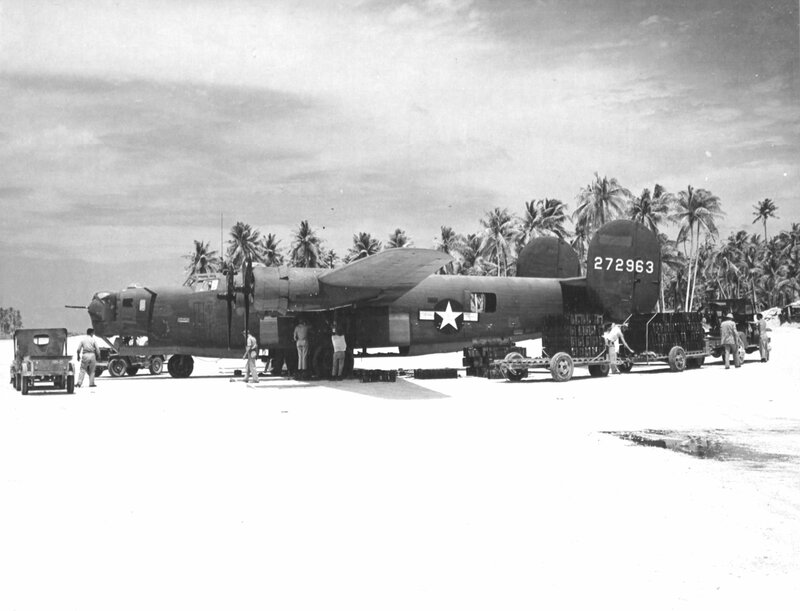 » B-24D Liberator of the 42nd Bomb Squadron being loaded with fragmentation bombs at Funafuti, Gilbert and Ellice Islands, Nov 18 1943. This photograph has been scaled down; full resolution photograph is available here (3,751 by 2,864 pixels). Note that her nose turret was atypical of D variant aircraft. This B-24D was modified after production with what was called the Oklahoma Nose because the modifications were made at Tinker Field in Oklahoma City, Oklahoma, United States. Only 64 B-24Ds received the Oklahoma Nose. The windows added to the lower nose also led this variant to be called the Droop Snoot. This particular aircraft, 42-72963, was lost over Mille Island in the Marshalls 1 Dec 1943, two weeks after this photo was taken. All ten crewmen were killed.